The sun is in Libra from September 23rd to October 22nd. If your sun sign is not Libra, these stones are still useful. The zodiac energy of each sign surrounds all of us based on the time of the year. The energies of Libra are at work now. Libra energy is full of a captivating charm and elegance. It is a very calm, very peaceful and very balanced sign. This time of year is perfect for looking for balance in all areas of your life. The symbol for Libra is the scales, weighing out choices and deciding what is right and wrong. Libras can be described as diplomats, they want everyone to be happy and are able to find options that are good for the greatest number. Libra is one of the most charming and likable signs, it's almost impossible not to like a Libra. They are full of positive energy and while Libra is a wonderfully happy sign, they struggle with making decisions, they simply cannot choose. A Libra feels that whatever choice they make could be wrong or that the other choice might be hurt or offended. When the sun is in libra we all experience the energy of Libra. 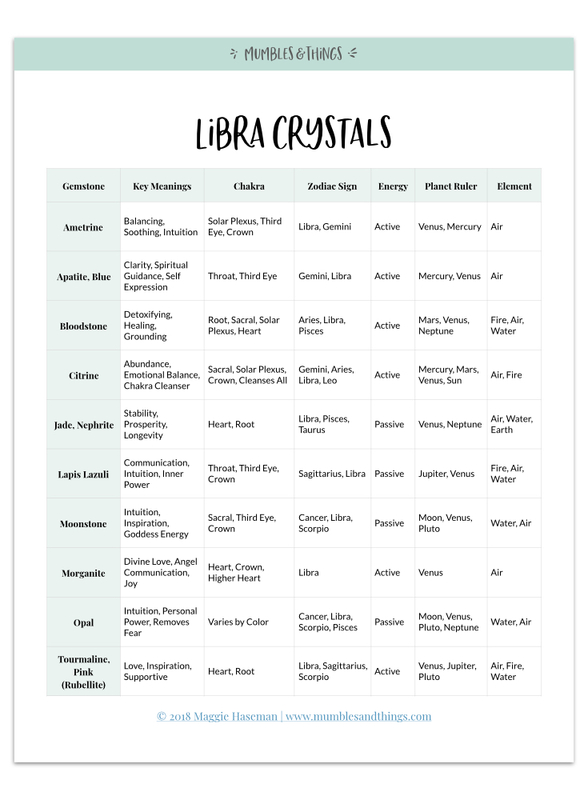 The crystals in this list work with these energies, so even if you aren’t a Libra sun sign you can benefit from them. Ametrine is great for balancing which is great for helping you to balance your options. It also encourages you to go with you gut and trust your intuition. Once, you've made your choice, it works to soothe you and help you feel like it was the right one. Apatite encourages clarity, which is wonderful for the indecisive Libra energy. Apatite can connect you with spiritual guides in times when you need a little extra help with a decision. It also supports self expression so that the peaceful, calming and joyful energies of Libra can shine through you. Bloodstone is mostly used for grounding. Any grounding stone is useful when working with the airy energy of Libra. Citrine is the stone of abundance. It can be used to balance your emotions, which is just as important as balancing life decisions. Jade (both nephrite and jadeite) can be used to help you feel stable in your decisions. Mahogany Obsidian will support you in any decision. it is another grounding stone to help the floaty Libra energy return to earth. Moonstone is another stone that supports your intuition. It can also give you inspiration when you aren't sure what choices you face. Morganite helps you feel divine love and supports you in knowing that this love will not leave you no matter what choice you make. You can use Morganite to communicate with angels and ask for their guidance. Morganite is also a stone which encourages the joyful Libra energy to express itself. Blue Lace Agate can keep you calm and stable in the face of chaos. We live in a chaotic world and this is a great challenge for the balancing energy of Libra. Blue Lace Agate also encourages communication where it might be a challenging to express yourself. Lapis Lazuli helps you to speak up when it is challenging to do so. It will support you trust your intuition, to know your mind and to speak your mind. Lapis Lazuli is another stone for self expression and inner power. Blue Tourmaline is all about honesty and compassion, which a Libra wants above all when making a decision. Blue Tourmaline provides increased intuition and also has a touch of fire, which helps this air sign to flow. Opal also guides you to trust your intuition and abandon any fear. It, like Lapis Lazuli has a little fire, which encourages your personal power. Pink Tourmaline provides support for all decisions and choices you make so you can feel confident in them. It is another stone that gives you inspiration in a time you might not know what your options are. Any Tigers Eye can be used with Libra energy but Blue Tigers Eye is especially useful. It helps you to be more aggressive: to make a choice and stick to it and to help you feel confident and comfortable with that decision. Sapphire brings you a sense of light, joy and peace. It will surround you with tranquility and help you to know your own wisdom. 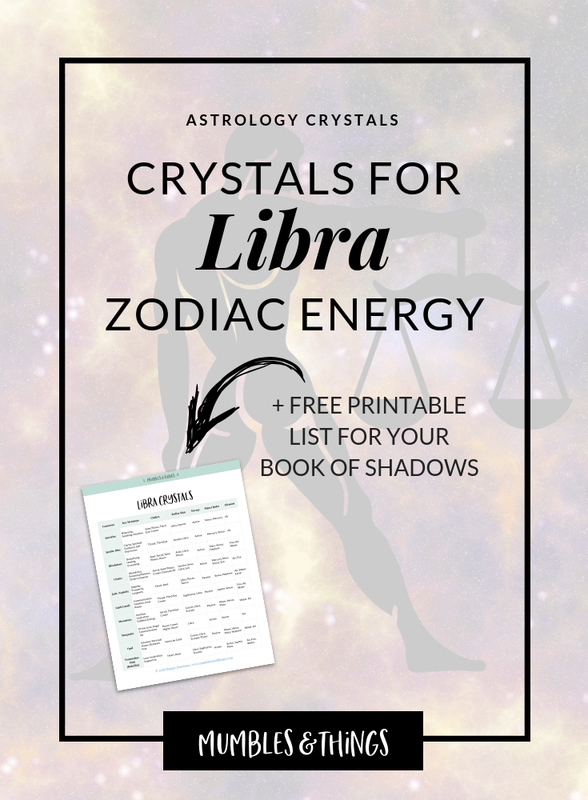 Want my list of Libra crystals? Click the button below to request your list to be sent to your inbox. 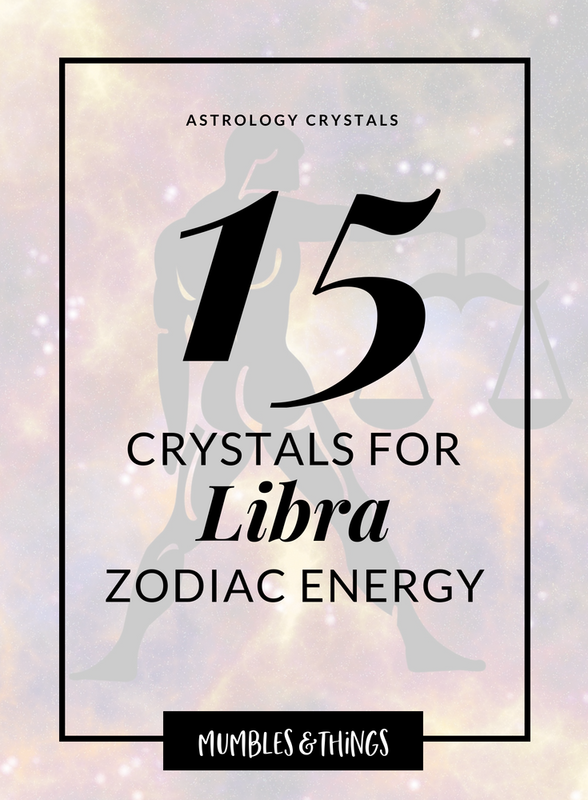 This list includes the top 10 crystals associated with the zodiac sign Libra, plus, the three key uses, primary chakras, polar energy, planetary ruler and element correspondence.